What are standard lighting setups for 2-3 people? What are some standard lighting setups for two or three people in a group? 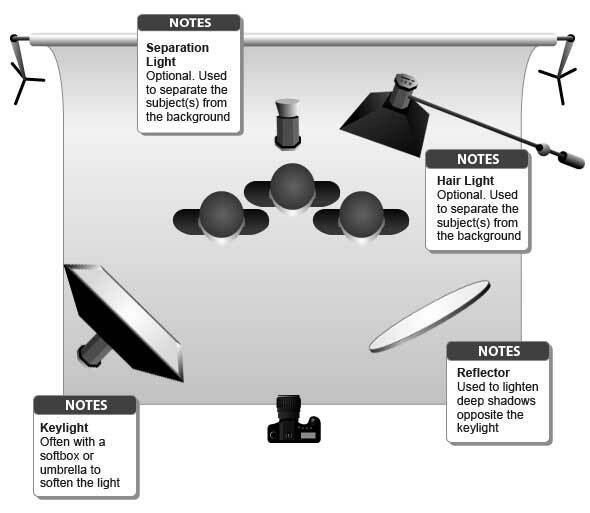 I just can't think of non-complicated setups that would apply some previously discussed (short, broad, butterfly, split, etc) lighting setups to groups of people. This school of thought essentially says that even in a group portrait, every subject is treated as an individual, and is lit individually. The pros of this method are probably obvious- fine-grained control over every single subject in the shot, and (if you do it right) amazing 'magazine-ready' shots. The cons, of course, are that it is expensive (because you need lots of lights, accessories, assistants, etc. ), and time consuming (because you have lots of variables). These are the types of shoots that take 8 hours to set up, and 10 minutes to complete. If done right, however, the results are unachievable by any other method. For the most part because of the cost and manpower involved in setting up shoots this way, it is exclusively the realm of advertising photography and magazine editorial shoots. I know several people who have 'begged, borrowed, and rented' their way into self-funding shoots like this for their portfolios, and the shots the captured instantly became the centerpieces of their work, because these types of shots look stunning, and there's really no way to 'fake' it. Things like hair lights, rim lights, separations lights, kickers, etc. can be added over and above the key light and reflector, but those lights would comprise what I think of as a 'basic plus' lighting setup. For a group of 2 or 3, the bare minimum you'll need boils down to just a key light and a reflector. 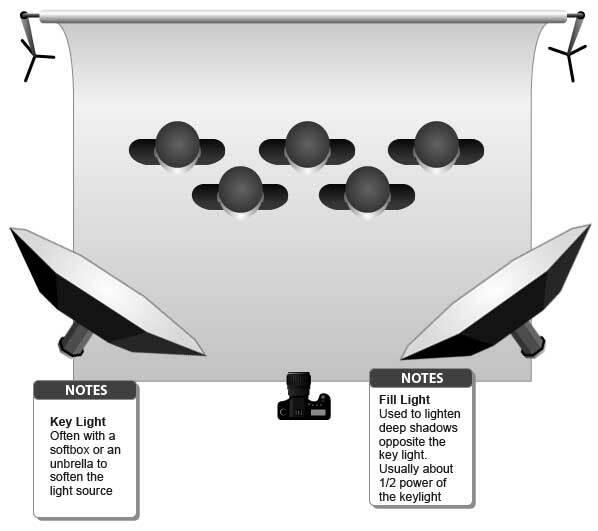 I know working professional portrait photographers who use this 1-light setup almost exclusively- it's a powerful setup, and can easily be the base setup for the majority of group (and even individual) portraits you are likely to encounter. Not the answer you're looking for? Browse other questions tagged lighting portrait studio-lighting lighting-basics or ask your own question. What is split portrait lighting? What are most important accessories for indoor portraiture? How to take photos of large groups (over 100 people)? Cheap lighting Vs second flash for reptile portraits?